Connect VTC oil control solenoid valve 2P connector terminal No. 2 to the battery positive terminal with a jumper wire. 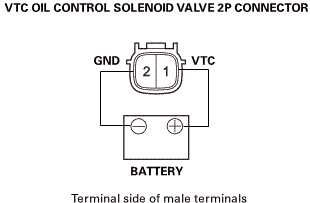 Connect VTC oil control solenoid valve 2P connector terminal No. 1 to the battery negative terminal with a jumper wire. 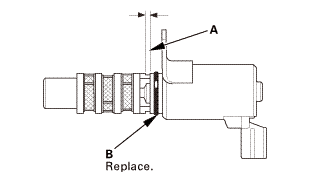 Measure the clearance of the valve (A). The clearance should be at least 1.2 mm (0.047 in). 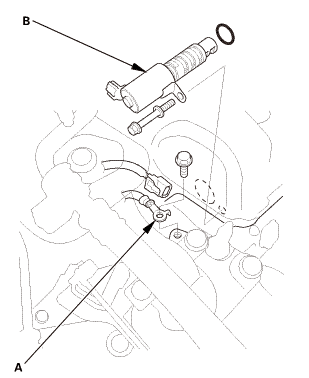 If the clearance is as specified, the valve is OK; reinstall it with a new O-ring (B). 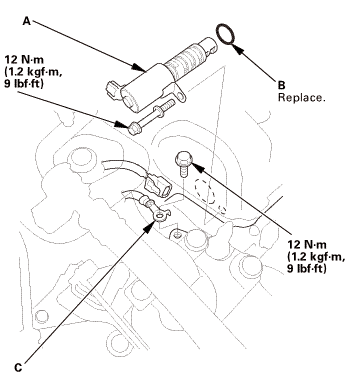 If the clearance is not as specified, install a new valve and O-ring.